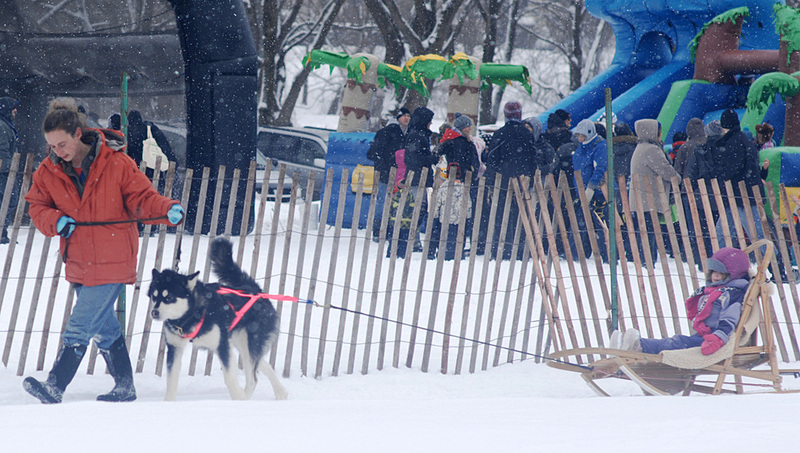 Above Photograph: Tinker, sledding with two teams, mostly malamutes and one Siberian Husky. In the above picture, Tinker is the dog on the far left. The next, a Siberian Husky, with the remainder all purebred Alaskan Malamutes. The below sections have pictures of my own, and other, Alaskan Malamute sledding, training, and racing. Various working clubs and working organizations offer certificates beyond conformation titles and many competitive events. The Alaskan Malamute Club of America and the Canadian Alaskan Malamute HELP League do 'fun' certifications and events for Working Lead Dog and Working Team Dog can be done by competing in competition events or by excursion. The majority are done by excursion, as few Alaskan Malamutes can win at racing. 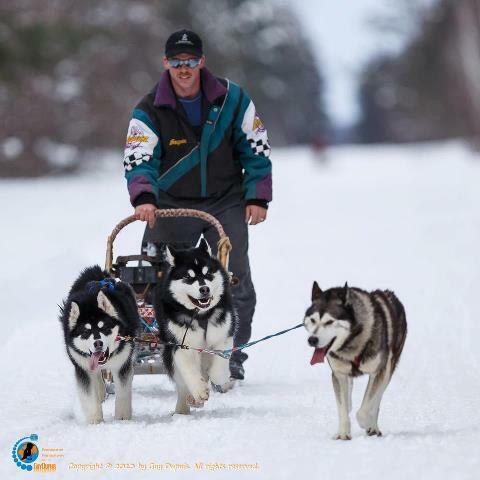 My Alaskan Malamutes have only ever done 'fun' sledding race working events and although I do lots of excursions with them, I am almost always alone. Most of their working wins are on scooter or weight pull at various events. My Alaskian Malmutes will be working on their Working Team Dog (WTD) and two possibly on their Working Lead Dog (WPD) certificates this year, though it may be on the scooter rather than sledding since we don't get enough snow. I do have quite a few pictures and photographs of them on sled, scooter and at the weight pulls. You can start to train your Alaskan Malamute puppy as soon as you have the dog. Hopefully the breeder exposed it to things necessary for 'working' - sound, equipment, being tied out, etc. If not, you can do all these things. For my last three dogs, I've been running them, with an older dog, when they reach about four months. Considering I weight 100 pounds, it's not an extreme amount of weight. Some breeders start them younger, a few older. Mostly common sense dictates. Don't put extremely heavy objects on a young, untrained dog. Don't expect to go for miles and miles with a young dog. Just keep it fun for them. Using an older, controllable dog to train your puppy with, works perfectly. Ernie trained off Tala (beginning at four months of age). Bert trained off Ernie. Ooky trained from Ernie. Ooky then trained her baby, Tinker. The older dogs usually already know the commands. The younger dogs simply follow along - and learn pretty quickly. The first dog I trained, Tala, was the worst. Neither she, nor I, knew any commands and so we learned as we went along. In the end, she was the best-trained dog I will likely ever owned, knowing well over 100 commands for all sorts of activities - but it began with bike running. And again, if there is any question that your dog might have hip dysplasia, DO NOT do any serious working or running with them, until you can have their hips certified. If the parents did not have their hips certified, assume there could be a problem. Ten years later and it's Tinker's turn with four teams of Alaskan Malamutes sledding (we don't get much snow where I live). Babies Meme and Dozer, Winter 2013, getting some experience, sledding with a new dog and person, Kent, who has sledded all my dogs, though mainly their mom Tinker, on his, and his wife's teams, while I take the others. Dozer Dog Sledding, giving dozens and dozens of children sled rides, in January 2014. 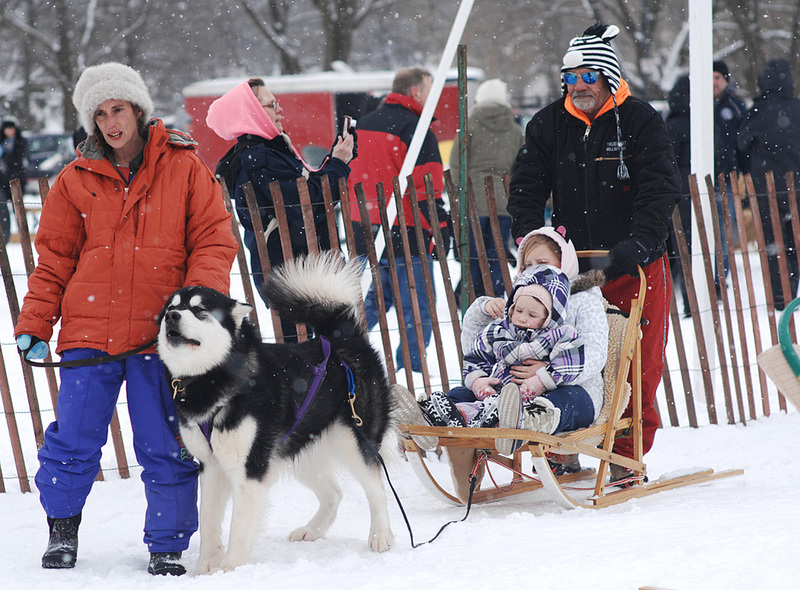 Meme Dog Sledding, giving dozens and dozens of children sled rides, in January 2014. Bert and Ernie achieve slowest time in the 10-year sledding race history. Bert and Ernie, running in a sledding race - 2005.